One of the delightful smells around Christmas time is feshly baked gingerbread cookies. That warming, scrumtious scent makes the mouth water and the taste buds tingle. 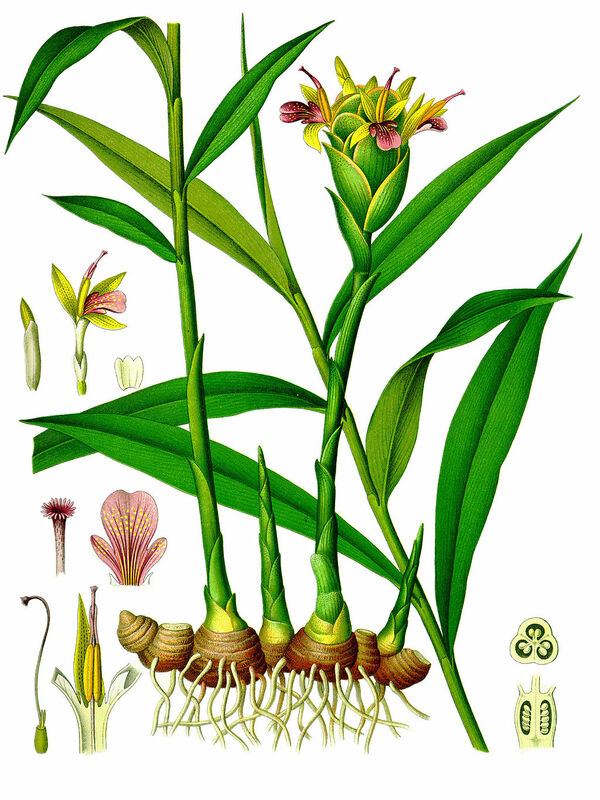 In aromatherapy, the body responds similarly to the fresh ginger odor. There are two types of essential oil that are steam distilled from the Zinbiber officinalis plant. One comes from the bark and the other from the leaves and twigs, the latter being more widely used in therapy. Ginger has been used medicinally in Asia since ancient times and had made its way to the west along the ‘spice route’ during the Middle Ages. Ginger was considered by the Chinese as a wonderful herb to deal with all moisture conditions in the body, from breaking up congestion in the lungs to relieving rheumatic pains in the joints. It is a very warming oil and is useful for all stagnant circulatory conditions; especially arthritis, muscle pain, sprains and strains. It is also helpful in stagnant digestive disorders such as flatulence, gas pains, stomach cramps and indigestion . Fresh ginger root grated in hot water with a drop of honey makes a great tea to stimulate gastric juices, relieving bloating and reflux discomfort. If you don’t have fresh ginger then substituting two or three drops of ginger essential oil can be equally stimulating (and adding a drop to store bought ginger ale really perks up the flavor!). Ginger is also considered a good oil to use when jet lagging or with motion sickness as it seems to balance a nervous stomach and refresh the senses. A drop or two of the essential oil can be used in a gargle for sore throats and is excellent for swollen glands. A warm compress placed around the throat area can clear mucus and catarrah, as well as reduce fever. It eases chest pains and calms a shivery body. With colds and flu, ginger warms, comforts and soothes aches and pains. Its antiseptic qualities make it a perfect oil to burn in an aromalamp to kill germs in the air. Ginger, when inhaled, is said to ease confusion and stimulate the mind. It increases courage and confidence and a sense of well being. Warming to the heart, it is a nice oil to burn or bathe in when feeling romantic and being a yang oil it has been known to help with male impotency. So this Christmas, when baking gingerbread cookies or adding the spice to pumpkin pie, thank those intrepid traders who brought ginger to Europe for our eventual use.